Who are we kidding: we all love hidden, secret restaurants. But Brick Lane’s Back in 5 Minutes, a bloody brilliant restaurant in the back of a shop with out-of-this-world-food, is so much more than that: it’s an incredibly thought-through dining experience you’ll never forget. Run by The Disappearing Dining Club, Back In 5 Minutes hides behind Brick Lane’s Ante Shop, serving a blend of Italian, Middle Eastern, French and British dishes.Everything there is so well thought-through that even the bread is home-made and hot, straight out of the oven. The options are many. Two courses for £30, three for £35 or a taste of everything (in six courses) for £45. I recommend the six-course £45 tasting. This way, you’ll get the chance to try some innovative, heavenly starters with your choice of main. 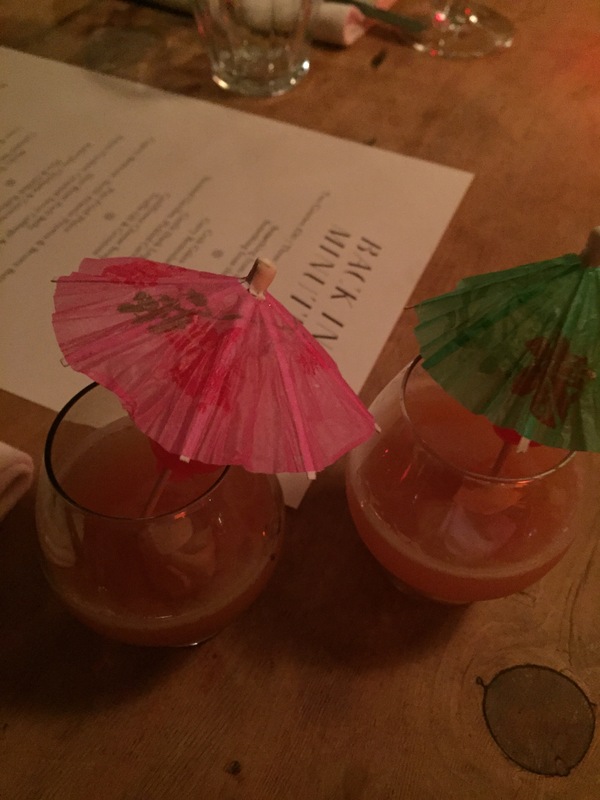 I started by sipping the house’s Mai Tai cocktail with Maraschino cherries and a vegetable and Parma ham wrap, followed by an interesting cauliflower cheese soup, served in a tiny straight-up cocktail glass. I then moved on to some flavoursome fried crab cakes with curry remoulade, followed by a confit duck leg salad with sauteed girolles mushrooms and orange, fresh with a kick you won’t get anywhere else. It’s the mains though that make Back In 5 Minutes an out-of-this-world experience: the chickpea, aubergine and cous cous ragout accompanied by an halloumi pitta is something you’d never get enough of, but the slow roast pork belly with potatoes, lardons and slow-roast cabbage will make up for it. A crispy, tasty dish, it’s definitely the jolly of the whole evening. To end the dinner right try the dessert, made of sticky toffee pudding with vanilla ice cream and lime and white chocolate cheesecake. Everything at Back In 5 Minutes is spot on: the bar, the wines, the decor are exclusive enough to make you feel part of the gang but so cosy to remind you of a family meal. The granny’s handkerchief, the rock music soundtrack, the impeccable service and the old radios create that home feel you need to sit back and enjoy the night, while the bespoke food and drink leave you that exclusive vibe you need to feel special. All I have to say is: check it out. There are too few nights out there that make you feel this happy.